Working towards more sustainable islands isn’t only about technology and infrastructure: it’s also a question of public awareness and changing everyday habits towards more responsible behaviours. 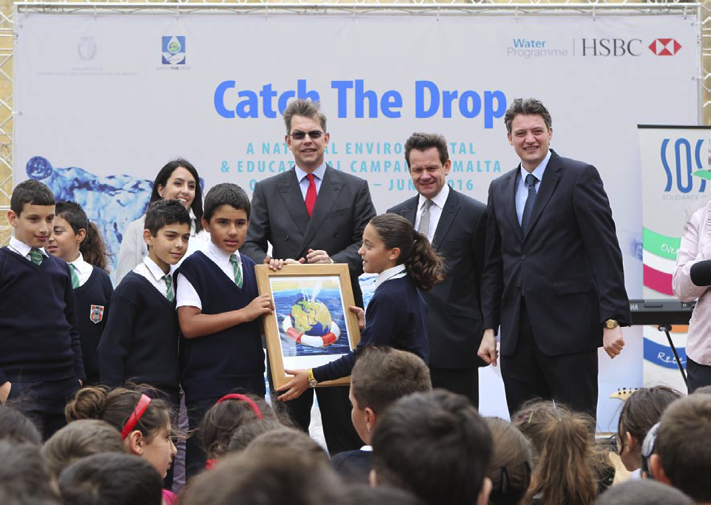 That’s the logic behind the three-year “Catch the Drop” campaign initiated by HSBC Bank Malta, which is aiming to reach out to every schoolchild in the country as a way to raise awareness about water issues, encourage conservation and efficient water use, and celebrate “good” water practices.“This campaign was not about making one-off donations but about partnerships and fostering of a new, environmentally-aware culture of thinking,” the bank comments, adding that its ambition is for the campaign to make a mark that goes well beyond its three years of activity (2013-2016). Catch the Drop is the biggest ever national environmental and educational campaign ofits kind in Malta, aiming to reach all the island’s 50,000 schoolchildren and encourage schools, companies, NGOs, the general public and local councils to participate. The project benefited from € 500,000 funding from HSBC Group as part of the HSBC Water Programme. “By reaching out to every single school child in Malta, the campaign is working toincrease awareness,” the bank explains. “This is far more important in reality than funding a more efficient desalination plant. Achieving sustainability is mostly about getting people to understand the responsibility they have for saving resources.” The project has held hundreds of presentations involving about 20,000 students a year and organised special celebrations to mark World Water Day and the 400th Anniversary of the Wignacourt Aqueduct as well as exhibitions and numerous school projects.